There are two Fred Hall Shows in Southern California. One is in Long Beach and one is in Del Mar. They serve the Los Angeles megalopolis area and the greater San Diego County area, respectively. They are very similar, but very different. 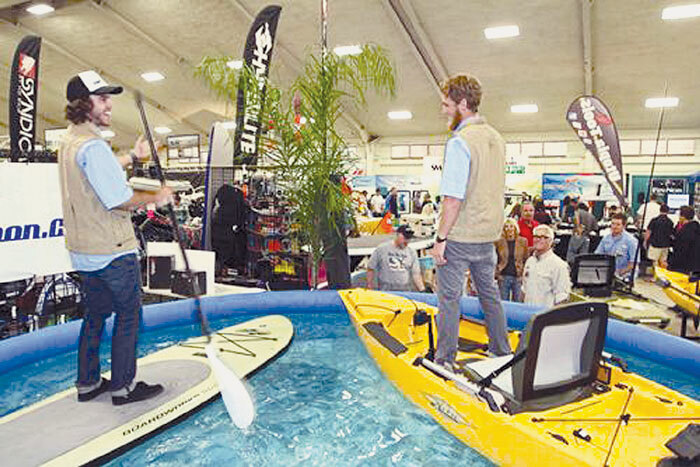 The Long Beach Show is larger, but the Del Mar Show is more “manageable.” For 2013, the Fred Hall Show … The Ultimate Outdoor Experience at the Del Mar Fairgrounds, March 21-24, will be brought to you by Progressive Insurance. The Del Mar Show has been the dominant outdoor recreation show in the San Diego market for 38 consecutive years. It is San Diego’s largest and oldest boat show, the area’s largest travel show and the only fishing and hunting show in the county. This year, the Fred Hall Del Mar Show will be the largest that it has been since 2007. There will be more boats and more booths. Fishing, travel, hunting, camping and diving will all be represented at this giant show. It is the largest event at the Del Mar Fairgrounds, other than the Del Mar Fair, and it is the oldest and largest consumer show of any kind in San Diego County. A full day of family fun activities awaits visitors to this great show. The San Diego County Ford Dealers Association has brought back the Paul Bunyan Lumberjack show. They will perform their lumberjack magic twice a day. The Ram Dock Dogs, a perennial crowd pleaser, will again make an appearance at the Del Mar Show. Seeker Rods will present the always-popular Saltwater Tank, filled with nearshore fish — and it will be the backdrop for hourly seminars. The Typhoon Bass Tank will be filled with local bass professionals talking about fishing the local San Diego lakes and all of the lakes in the West. Mammoth Lakes will present the Kids Fish Free Trout Pond, where kids under the age of 15 can catch a trout. Costa sunglasses will again present Scott Leysath the Sporting Chef at the Sporting Chef Café. Leysath will prepare fish and game for patrons to sample — and Tommy Gomes, from Catalina Offshore Products, will present a fish fillet demonstration each day. Recording artist Gary Schiebler will sing and play his guitar at the Costa Sporting Chef Café. There is also a new Eastern Sierra Experience Seminar area, where daily seminars on the Eastern Sierra will be presented by Mammoth Lakes. The O’Brien Building and most of Bing Crosby Hall will be filled with boats — lots of boats. There will be tow boats, pontoon boats, deckboats, fishing boats, kayaks, stand-up paddleboards, cruisers and just about anything that floats. A giant wakeboard display will be presented in Bing Crosby Hall. And you can test drive a new Toyota at the show. Accurate Fishing Products, Goal Zero and KeepAmericaFishing.org are major sponsors of the Fred Hall Show … The Ultimate Outdoor Experience. Show hours are noon-8 p.m. Thursday and Friday, 10-8 p.m. Saturday and 10 a.m.-6 p.m. Sunday. For more information, visit fredhall.com.